"Scraping Data from LinkedIn Made Easy!" LinkedIn is the largest online professional social network and has the personal information of millions of working professionals from all over the world. LinkedIn Scraper allows you to automate the gathering of this data and leverage it for you or your companies personal use. LinkedIn Scraper collects 6 points of data from each person including present position, education, title and more. See the list below for the full list of the data you could be gathering. 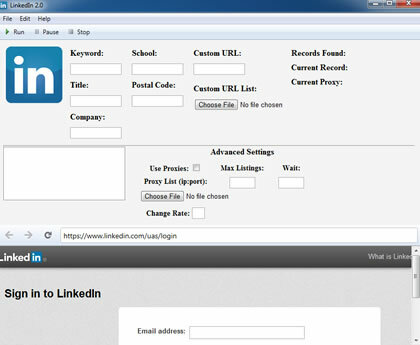 Based of my successful Local Scraper software, LinkedIn Scraper allows you many options to dig down into LinkedIn's Data and scrape it for your self. I have spent months developing and testing this scraper and now its ready for you to try out your self. We collect 6 fields of data and provide multiple ways for you to drill down to exactly the data you are looking for. Making exact targeting simple and easy to do. All results will be scraped automatically and auto saved into an easy to use CSV format. Here is the data you could be scraping from LinkedIn with LinkedIn Scraper. For a limited time order LinkedIn Scraper for only $39.99! * LinkedIn Scraper only supports Windows OS. ** Your purchase is for a Single License of LinkedIn Scraper. Your Single License allows you to install the program on two computers.